From time to time I've been privileged to make custom orders for people. It's always a challenge, but one that I always rise to. One order was from someone who wanted a doll like the one her daughter (now 21) had as a baby. She only had one photo of the doll with her baby daughter, and not much of the doll was on show. I went to a wonderful patchwork and quilting shop where thousands of fabrics are for sale (The Log Cabin, Billericay) and the assistant found me a lovely fabric which was reminiscent, though not identical, to that of the doll in the photo. I set to, and the result was a beautiful doll which I'm sure Jemma was delighted with. She is featured in the photo. Not long after that, I was asked to turn a much-loved blouse into clothes for a rag doll. I've written some blogs about this project. Joy-Anna chose all the fabrics and trimmings from her mum's collections of bits and pieces, and I had the job of turning them into a lovely doll. I have to say, I was really pleased with the result. Take a look at my blogs on the News and Developments page to read more about this particular project. Since then I've made a boy doll for Joy-Anna's little brother Ezra, which also features in a blog on my News and Developments page, so again, head over to the page to read more. I was recently asked to make a rag doll like the original Jemima rag doll in BBC's PlaySchool back in the '70's. There was no pattern - only pictures in Google Images. This was probably the most challenging project to date! I made a doll which looked like Jemima (though not quite the same) and the customer was so pleased she asked me to make another one as well. In addition, I've made several of my dolls and topsy-turvy dolls as custom orders, and I've had lots of lovely letters thanking me for them (see my Customer reviews page). At Christmas 2017 I was asked to make two dolls for granddaughters of my customer. They live in Australia. Her daughter-in-law sent me dresses the girls wore as toddlers and I used the fabrics to make the clothes for the dolls. They were thrilled with the results. One of the dolls is shown in the photo. I incorporated the little buttons and appliqué badge from the original outfit in the doll's clothing. Earier this year I had a custom order was for a bridal doll. The doll turned out beautifully and I understand the bride loved her when she received her on her wedding day! See my blog on the News and Developments page for pictures and more information about this particular doll. I've included one photo of her on this page. 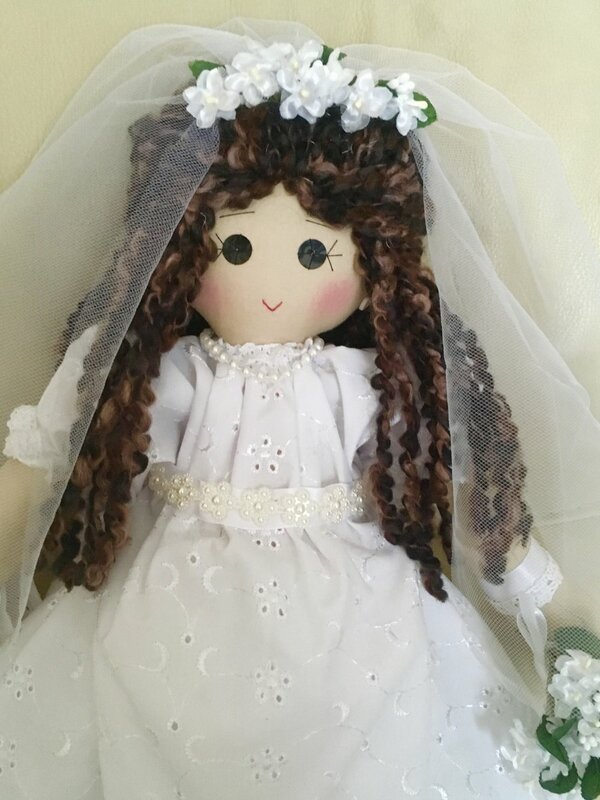 Making this doll inspired me to include a bride on my stall at craft fairs, in the hope that customers might want a custom order for a daughter, daughter-in-law or bridesmaid(s) at a wedding. Of course, people of any age might simply want one of my dolls dressed as a bride because they love it. More recently I was asked if I could design a christening doll. The customer had ordered one from a seamstress a few years ago when her niece had her first baby. Since then however, the seamstress had gone out of business. The customer sent me a photo of the previous christening doll so I had some idea what she was after. I searched for some suitable fabrics and created a beautiful doll with dark hair, as requested. The finishing personal touch was some hand-embroidered wording on the underskirt commemorating the occasion of the christening. The customer was overjoyed with the result and I hope the doll will be much loved by the little girl as she grows up. There’s a blog in News and Developments for more on this particular project. My most recent project has been to create a schoolgirl doll wearing a uniform with a satchel on her back. This was quite a challenge but I was thrilled with the result. The satchel worked really well and I managed to make the doll bright and very much like a traditional rag doll yet fulfilling the brief. I wish my school uniform (many years ago now!) had been as attractive!! If you would like a custom order for any of my products, get in touch with me to discuss your requirements. Custom orders are individually priced.